Welcome to Cane Corso de Impero Russo the Home of Multi European Champions! We are the Sister Kennel to the World Famous Stanley Pat Kennel from Russia. Impero Russo is properly translated “the Russian Empire”. Cane Corso “de Impero Russo” is a kennel owned and operated by Yulia Washington, and currently located in the Dallas area of Texas, US. The photo at the top of our pages is of the famous Red Square in Moscow. Not literally red, in the Russian language "red" was initially used as an equivalent of "beautiful", so the Red Square would also mean "a beautiful square". Back home in Russia we owned and loved our Rottweilers. When we moved here I was in search of a Rottweiler. I saw a Cane Corso in Dog Fancy magazine and I fell in love with the breed instantly! We searched for two years for a dog here in the Unites States. However, as fate would have it, I ended up finding a Champion bloodline and perfect dog for us in Russia. Our world famous bloodlines are comprised of many Champions. Like all Cane Corso owners, the image of the breed is important to us. Also the history of why the dogs were bred is important to us. Descended from the now-extinct Roman Molosser (the war and fighting dog of ancient Rome), the Cane Corso hunted big game, controlled unruly cattle, and protected his home. "Often described as a "coursing mastiff," the Cane Corso outdoes the other mastiff breeds in athleticism, agility, speed, energy level, and sense of adventure. This robust dog needs his share of exercise, but above all he requires personal interaction and lots of companionship. 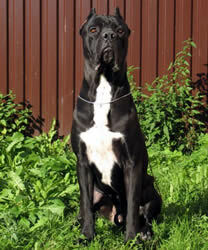 The Cane Corso is more attentive and more responsive to training than other mastiffs, and though quite dominant, will respect an owner who is confident and consistent. This breed gets along very well with children. They are protective, yet gentle. The Cane Corso has a very stable temperament. This is why we love and honor this unique breed so much. I am very active in the show ring, both exhibiting my own dogs, and providing handling services as well. If you are looking for a dog for the show ring or a pet for the family the Cane Corso is the champion of all dogs!